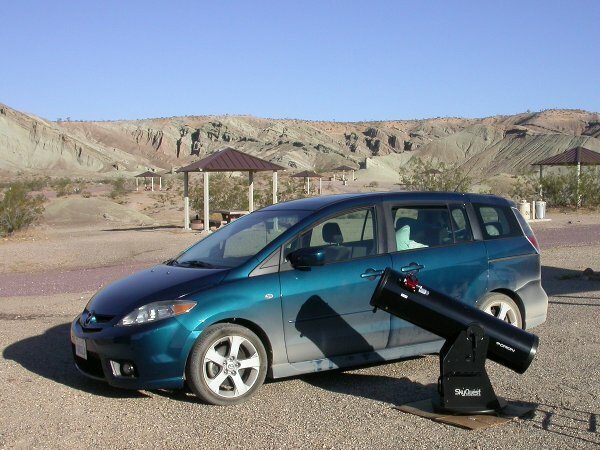 Owl Canyon Campground is a few miles north of Barstow, in the Mojave Desert on BLM land. There are picnic tables, shelters, fire pits, and restrooms but no running water, and if you spend the night you’re supposed to leave your camping fee–all of six bucks–in a metal can on a post near the entrance. It’s almost exactly 90 miles from my house, on the other side of the San Gabriel Mountains. Although the Dark Sky Finder puts the campground on the border between the green and blue zones, to my light-pollution-conditioned eyes, it is pretty darned dark out there. I was there observing from a little before 9:00 PM Saturday night until about 5:00 AM Sunday morning. I set up my 10″ scope and took a quick turn around the sky, hitting the best and brightest clusters, nebulae, and galaxies. M51, the Whirlpool Galaxy, showed spiral structure. I saw not one but two dark lanes in M31, the Andromeda Galaxy. M27, the Dumbbell Nebula, looked more like a football wearing a bowtie, so extended was the nebulosity. I had seen some of these things before, in larger telescopes, but they were all first-time observations for me, using my own telescope. And the night was just beginning. Taking a break from the telescope, I pulled out my 15×70 binoculars just to see what I could see. And what I could see was incredible. The Milky Way was a wide, detailed arch of pale light stretching across the sky, so rich that I found star clusters and nebulae far faster than I could log or identify or even count them. I saw the North American Nebula, which really does look strikingly like North America, for the first time. Buoyed by that success, I went after the Veil Nebula, a double arc of wispy light expanding out from an ancient supernova. It was there, not bright, but unmistakably present. Later, using the telescope, I saw in the Veil the riffles of detail that I had previously seen only in long-exposure astrophotos. I didn’t see all this at once, of course. After about 5 minutes of cruising the sky with binoculars, I realized that I was going to need a more extended, more comfortable look. I put a blanket and pillow on an empty picnic table, stretched supine, and spent the next two hours just looking up in wonder, much of the time with my naked eyes alone. Lying up on the picnic table, my immediate surroundings were out of even my peripheral vision. The dome of the sky came down on all sides to the mountains, bluffs, and buttes that ring the campground on all sides. I was, therefore, alone beneath the cosmos, on a rocky world of my own. There are about two dozen campsites at Owl Canyon. Saturday night, only three others were occupied, and none of them were close to me. But as usual when observing at a public campground, after setting up I had walked to the two inhabited sites I could conveniently reach (the third was across a minor canyon) and let the people there know that I had set up a telescope and that they were welcome, but certainly not obligated, to drop by for some stargazing. For the first time ever, I got no takers. To be out there in that fantastic place, seeing such spectacularly evocative and beautiful things, and to have no one with whom to share them, was almost unbearable. I felt embarrassingly wealthy, like someone devouring a feast while his neighbors on either side go hungry. About midnight I got down off the table, went back to the scope, and started on my planned observing program. Whether this reflects dedication, more focused curiosity, or a species of retreat from the terrible immensity which I had recently been contemplating, even I am not sure. You are welcome to perform the experiment yourself and report back. In fact, I strongly recommend it. At some point I knocked off to take some photos of Jupiter, which by the early morning hours was almost halfway across the sky and the brightest single source of light I could see. I got some pictures, but the Great Red Spot was not in evidence. Fortunately Jupiter rotates quickly, once every 9 hours, so I had a feeling that I would catch the spot if only I was patient. I went back to the deep sky. About 4:00 AM I was working the northern sky when I saw a most arresting site: an immense pale dome rising like a puffball mushroom behind a mountain to the east. This was of course the moon, but I had never before watched the waning crescent moon rise, and certainly not from a site as dark as this. The waning crescent moon leads the sun; the illuminated part is of course sun-wards, so the “dark” part is to the west and rises first. And this is what I saw coming up over the mountain: not the thin sliver of the moon illuminated by the sun, but the rest of the disc lit only by Earthshine. 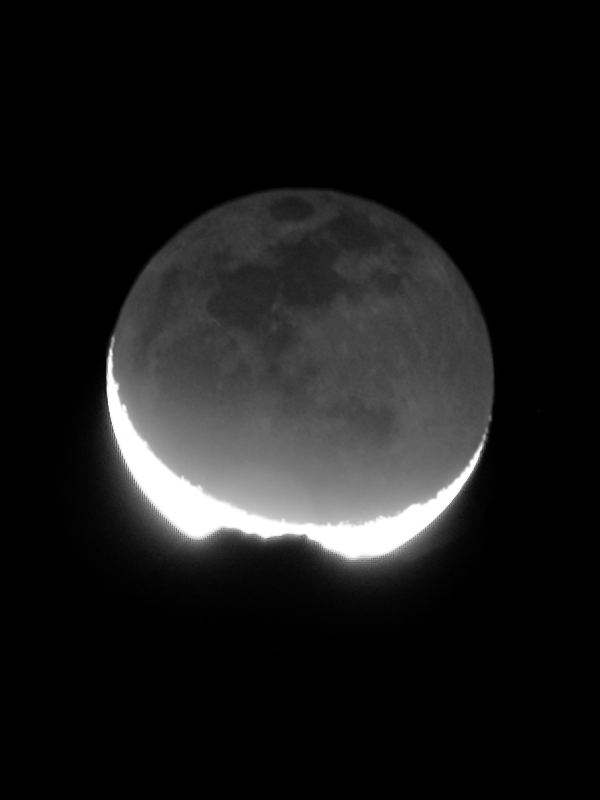 By the time I got the scope pointed in the right direction and the camera properly set, the bright “horns” of the sunlit moon were over the horizon, but the summit of the mountain still took a bite out of the disc. By this point I had been awake for almost 20 hours and observing for more than 7, and I was starting to wind down. But I went back to Jupiter for one last look, and sure enough, the Great Red Spot was there. And above the GRS was a little black BB: the shadow of a moon crossing the face of the King of Planets. The visible moons from left to right in this shot are Europa, Ganymede, and Callisto. 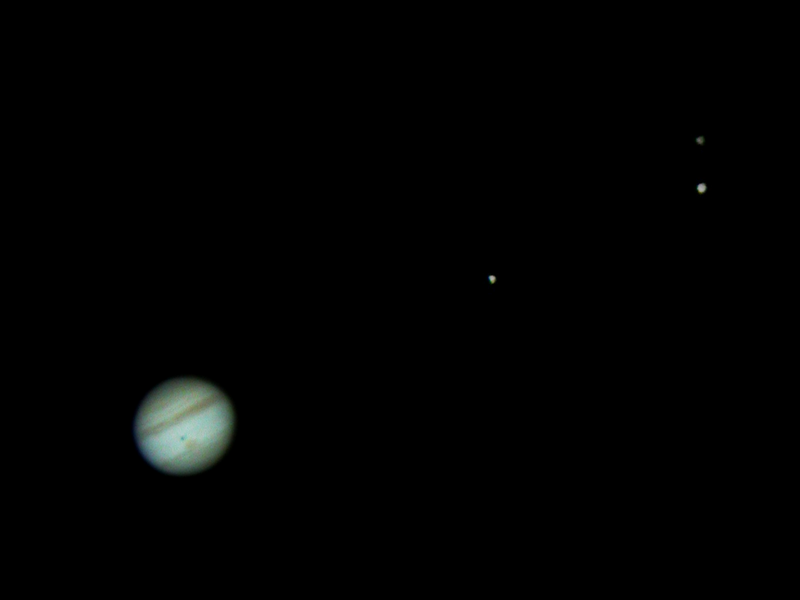 Io is invisible in front of Jupiter, at least through my telescope, but it is the one casting the shadow. After Jupiter I crawled into the car, slept for 3 hours, and then drove into Barstow to the hotel where Vicki and London were staying. The next night I drove them a couple of miles out of town and showed them the Milky Way. And now… now all I want is for the next few weeks to pass quickly, and for the next dark of the moon to find me once again in the desert, under beautifully dark skies, staring up in wonder. Uh, dude. You want the next few weeks to pass quickly? Well, obviously that doesn’t include the week that I’m in England with you. Chalk it up to, er, artistic license. I love the picture of Jupiter and the moons. Top stuff!